As you might expect, Adobe’s $699 Adobe Photoshop CS4 ( ) contains a treasure trove of goodies for pixel-pushing photographers. But you’ll also find some unexpected helpers tucked inside CS4’s bundled applications, Adobe Bridge CS4 and Adobe Camera Raw 5. Here are five favorites all photographers should check out. Say you have a folder full of images that you want to winnow down to a collection of favorites. Bridge’s Review Mode is perfect for sorting your images into keepers and tossers. Open Bridge, click on the folder you want to sort, and then press command-B. In this mode, your photos appear as if they’re on a carousel. Think of this as musical chairs for your photographs. Use the right- and left-arrow keys to navigate from shot to shot. Remove images from the carousel by pressing the down-arrow key. (The photo isn’t deleted from its location in the folder, only removed from the carousel.) Cycle through the shots as many times as necessary until you’re pleased with the survivors. Once you’re satisfied, click on the Make Collection icon in the lower right corner of Review Mode. Bridge gathers your favorites into a virtual collection. Name the collection, and you’re set. 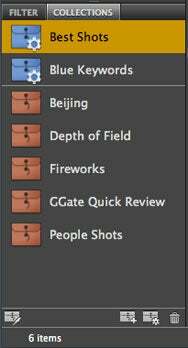 Another of my favorite Bridge CS4 features is the ability to make Collections. These ad-hoc folders are almost identical to that same great feature in Adobe Photoshop Lightroom and to Albums in Apple’s Aperture. Collections let you gather together images in virtual folders without moving the files in the Finder. Why is this important? Because you want the flexibility to play with your photographs without compromising the organizational structure you use to keep track of them. For example, if you need a folder of cat portraits for a project, create a Collection by clicking on the New Collection button at the bottom of the Collections panel, and then drag in virtual copies of the images from the Content panel or the Finder. When you’re done with the project, you can trash the Collection (click on its name and then click on the trash icon), leaving the original shots untouched and organized according to your folder hierarchy and naming conventions. Bridge's collections (shown in the Collections panel) let you pull together virtual gatherings of images without changing the organization of your folders. Even better, Smart Collections automatically assemble photos for you based on a variety of criteria. Want a folder of your best shots? Make a Smart Collection that gathers images you’ve given a rating of 4 stars or higher. To do so, click on the New Smart Collection button at the bottom of the Collections panel, specify your criteria, and then click on Save. You’ll find the Collections panel on the left side of the Bridge interface. Manually created Collections are represented by brown folders; Smart Collections are blue. (If you don’t see them, click on the Collections tab to reveal them, or select Window: Collections Panel.) Icons for editing Collections, creating new ones, or trashing existing ones are located at the bottom of the Collections panel. Tip: Need a closer look at an image in a Collection? Click on the image once and then press the spacebar to make the photo fill your screen. Hit the spacebar again to return it to thumbnail size. Now that you’ve collected all your best shots, it’s time to learn about one of the most useful new tools in Adobe Camera Raw 5—the Graduated Filter. This feature solves the age-old problem of balancing bright skies and dark foregrounds in your landscape scenes. Select an image in Bridge and press command-R to open it in Camera Raw. The edits you make here are nondestructive, which means you can play with photos all you want and then return to the original by choosing Camera Raw Defaults in Bridge (select Edit: Develop Settings: Camera Raw Defaults). The Graduated Filter tool is in the top toolbar, fifth from the right. Click on it (or just press G), and then drag the cursor from top to bottom in your image (or any other direction you want). Adobe Camera Raw builds a filter that goes gradually from dark to light, making it perfect for darkening a bright sky without affecting the foreground. Adobe Camera Raw's Graduated Filter tool lets you darken skies without changing the foreground. So instead of the original's less-than-vibrant sky and washed-out water, you'll have a more color-balanced image. But the Graduated Filter tool isn’t just for exposure adjustments. Once you’ve made your selection, you can also play with sliders for Brightness, Contrast, Saturation, Clarity, Sharpness, and Color. 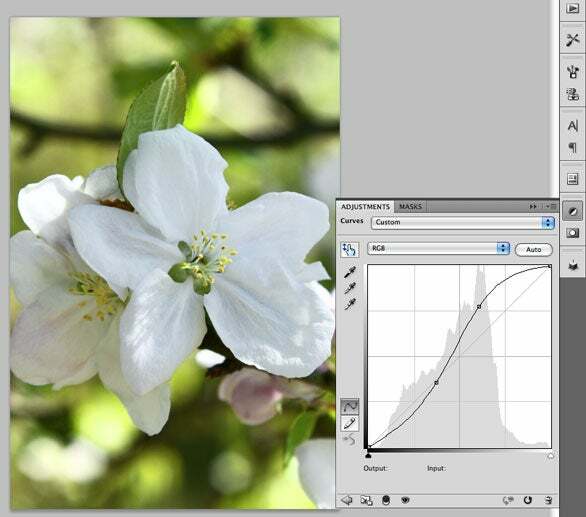 Camera Raw provides you with presets for each of these filters as well, represented by minus (-) and plus-signs (+) at the edges of each slider. In the Graduated Filter’s Color presets, the plus-sign slider applies warm colors (yellow/orange) to the image while the minus-sign slider applies cool colors (blue). You can apply multiple Graduated Filters to one image, edit them, and even revisit the image later on if you’ve changed your mind. Photoshop’s Targeted Adjustment Tool lets you adjust a specific tone or color by clicking and dragging on your image. You’ll find it in both the Curves and Hue/Saturation panels within the Photoshop CS4’s new Adjustments panel (Window: Adjustments). For example, in the Curves Adjustments panel, click on the hand icon to activate the Targeted Adjustment Tool. Then click on the area of the image you want to adjust and drag up or down to lighten or darken the selected tones. The more you drag, the more intense the adjustment. I usually adjust a light area of the image first and then create a second adjustment in a darker area. Photoshop's new Targeted Adjustment Tool makes it easier than ever to work with curves. You have similar capability in the Hue/Saturation Adjustments panel. To increase Saturation, click on the hand icon and then click and drag on your image to the right. Decrease saturation by dragging to the left. Hold down the command key while dragging to adjust the Hue. Assess the impact of your adjustments by clicking on the eyeball icon in the Layers panel to hide or display the change. The beauty of this approach is that Photoshop CS4 automatically creates an adjustment layer when you select a tool in the Adjustments panel. Save your file as a layered document to go back at any time and make changes. Tip: Select File: Save As to save the Photoshop version of your photo, and then place it in the same folder as the original. That way you can view them side-by-side in Bridge. When you’re working on a large image, it’s easy to get lost in the pixels while making adjustments. While it’s often necessary to work at 100-percent view, that makes it difficult to maneuver from one part of your image to another. Photoshop CS4 has improved its built-in navigation system so you never have to ask for directions. Now when you’re viewing your image close up and need to move to another part of it, select the zoom tool and then press the H key while holding down the mouse button. Your photo zooms down to Fit In View mode and Photoshop converts the cursor to a rectangle that you can move to any part of the picture. When you let go of the mouse button, Photoshop takes you to the new location but returns you to your magnified view. Move around your photo effortlessly with Bird's Eye View, new in Photoshop CS4. The best thing about these new CS4 tools is that you can string them together to create an efficient mini-workflow. They make it that much easier for photographers to select, sort, correct, and view images.